In this poem, Yeats expresses his inner struggle between his interest in the occult and his interest in Christianity. The Danaan children are the “children of the magical world of Faerie,” and as M. L. Rosenthal points out are considered “irresistible yet a threat to human love and security.” So the children symbolize mysticism and the occult, while Mother Mary represents Christianity. In the poem, three of the twelve lines begin with the phrase “Desolate winds,” emphasizing the importance. Symbolically, the number three is likely meant to evoke the Christian trinity. Yeats sees Christian theology as opposed to the exploration of the psyche (symbolized by the wandering sea); as a hindrance to the human spirit returning to the Edenic state (symbolized by the flaming West – think cherubim with flaming sword at east of Eden, which would be west for those wanting to reenter); and finally as a doctrine of reward and punishment intended to keep people meek and subservient (Heaven and Hell). One last thing I want to mention regarding this poem. I struggled a bit trying to figure out what the ger-eagle was. I’m not 100% sure, but I suspect that Yeats meant for this to be phonetic, where ger means gyre. This would then become a precursor to the imagery he would later use in “The Second Coming.” If ger does mean gyre, then Yeats is saying that the unappeasable host of Faerie will escape to the North following the apocalypse, or the great revealing of that which is hidden from our collective consciousness. This is just my interpretation of this very difficult poem. If you have other insights into the hidden symbolism, please feel free to share them in the comments section below. Cheers! In this book, Alkinoos holds a feast and a competition in honor of his still unknown guest, Odysseus. 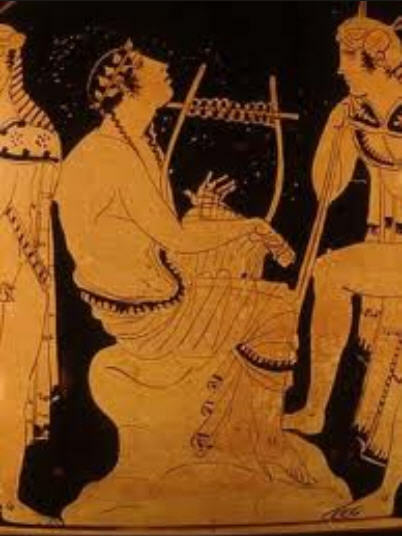 During the feast, Demodokos, a blind bard, sings songs which include tales of what happened to Odysseus, which stir deep and painful emotions within Odysseus as he listens. So as I mentioned in my last three posts, each of the previous three books dealt with the theme of resurrection and rebirth associated with an element. In Book V, Odysseus is reborn through the element of earth; in Book VI he is reborn through water; and in Book VII he is reborn through fire. Now, to complete the cycles of rebirth, in this episode Odysseus experiences resurrection through the element of air. The element of air is symbolized through the breath of the bard, Demodokos. As the bard sings the tales of Odysseus, his breath gives life to Odysseus’ past, essentially providing immortality through the art of poetry. The following passage is worth a closer reading because it contains the key to understanding the importance of the bard’s voice in regard to the rebirth through air. who cleared a space and smoothed a dancing floor. Odysseus marveled at the flashing ring. The first thing to notice is that this takes place in a circle, which is a symbol of rebirth and continuity. The bard is placed in the center, signifying the central importance of the singer in the divine cycle. The dancers, representing action and emanation, circle around the source of the divine breath. It is also important to note that we again see the appearance of the number nine, the importance of which was established in Book III where the number nine symbolizes the connection between the earthly and the divine. I want to point out that Demodokos sings three times. There is symbolic significance to this, since the number three represents, among other things, the three stages of life: birth, growth, death. After that, the cycle repeats itself with rebirth. When we get to the third song, it is Odysseus who requests the theme, which is about how he took the lead in the attack from within the wooden horse at Troy. the horse, tall on the assembly ground of Troy. Here the breath of the poet resurrects Odysseus as the words inspire visions. Words have the power to create, and many creation myths use breath or words as a symbol for the source of divine creation. For me, it makes sense that this element should be employed as the fourth level of rebirth for Odysseus. Thanks for taking the time to read my thoughts, and have a blessed day! This book takes place in Pylos. 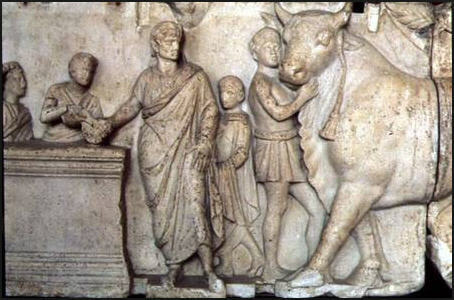 Telemachus and Athena (disguised as Mentor) arrive and witness a religious ceremony in which 81 bulls are sacrificed to Poseidon. Afterwards, they meet with Nestor who relates what he knows about what happened to Odysseus after the Trojan War. The number 9 appears several times in this book. First, at the ceremony, there are nine congregations and each one is offering nine bulls, for a total of 81 bulls. It is also worth noting that 81 in some forms of mystical numerology is broken down to 8+1 which again equals 9.
thighbones of fat lay burning for the god. The number nine also appears when Nestor is relating events to Telemachus and Athena. up to the bitter end that Zeus begrudged us. The number 9 is a truly mystical number, and I suspect its prominence in this book has symbolic meaning. Of all the single digit numbers, nine (9) may be the most profound. Composed of three trinities (3 times 3 equals 9), nine represents the principles of the sacred Triad taken to their utmost expression. The Chaldeans believed 9 to be sacred, and kept it apart in their numerology from the other numbers. Nine has been and in some cases still is considered thrice sacred and represents perfection, balance, order — in effect, the supreme superlative. In kabbalistic numerology, the number 9 corresponds with the sefirah Yesod and represents the power of connection, particularly between the earthly and the divine. Yesod (Hebrew: יסוד “foundation”) is a sephirah in the kabbalistic Tree of Life. Yesod is the sephirah below Hod and Netzach, and above Malkuth (the kingdom). It is the vehicle, from one thing or condition to another. It is the power of connection. The sephirah of Yesod translates spiritual concepts into actions that unite us with God. It is often associated with the Moon, because it is the sphere which reflects the light of all the other sephirot into Malkuth, and it is associated with the sexual organs, because it is here that the higher spheres connect to the earth. It plays the role of collecting and balancing the different and opposing energies of Hod and Netzach, and also from Tiferet above it, storing and distributing it throughout the world. It is likened to the ‘engine-room’ of creation. So my interpretation of this section of the Odyssey is that it is establishing a connection between the human and the divine, the conscious and the subconscious, the known and the ineffable. It is also worth noting that this all occurs in the third book, with 3 being the square root of 9. There are other interesting aspects and passages in this book, but I think this is enough to mull over for now. Of course, please feel free to share any thoughts or things you would like to discuss in the comments section below. Thanks for stopping by.